Scroll down to read what critics and audiences have been saying about John Kolvenbach’s disarming story of loneliness defeated by love. With Erin Cronican*, Marnie Klar*, Javan Nelson, Brandon Walker* and Jason Wilson. Meet Beane. He's depressed. His well-meaning sister, Joan, and brother-in-law, Harry, try and make time for him in their busy lives, but no one can get through. Following a burglary on Beane's apartment, Joan is baffled to find her brother blissfully happy and in love with his assailant, Molly. Suddenly Beane's got something to live for, and that's contagious enough to transform his sister's life too - right down to the nuts and bolts of her marriage. Unfortunately, Beane's got a problem that could land them all right back where they started. Funny, enchanting and wonderfully touching, John Kolvenbach’s Olivier Award-Nominated, offbeat comedy is a rhapsody to the power of love in all its forms. Named a "Voice Choice" by the Village Voice! Chris McKittrick, Daily Actor - "One of the best NYC theaters wows me again...Now in its fourth season, New York City’s The Seeing Place has constantly demonstrated that what it offers is versatility in its productions, but the only thing that never changes is the quality of the performance and the value of the ticket prices... There’s a lot of nuances that come through here, most of which you can’t find on the page a play’s written on. After seeing four performances from The Seeing Place I can assure you that you’re not going to find this level of talent at this price anywhere else in Manhattan. " Will Kenton, Cultural Capitol - "The Seeing Place Theater’s production is as close to perfect as Love Song will get. Marnie Klar’s (Joan) transformation from hard-bitten and shrill to sensuous and compassionate compliments Jason Wilson’s (Harry) evolution from obtuse dude to sensitive guy. Erin Cronican is feisty and fun as Beane’s imaginary friend Molly. And Brandon Walker’s (Beane) is equally depressing and horrible in the first act as he is matured and right on in the second act. Love Song is the kind of show The Seeing Place does very well, and it is their commitment to affordable, entertaining, live theater that keeps audiences coming back for more." Zak Risinger, Theatre is Easy - "Love Song is definitely a thinking person’s comedy.... told with a lot of honesty and heart performed by a strong ensemble. This production is extremely intimate and personal. The ensemble works exceptionally well together and I would be hard-pressed to single any one performance out over the other. Every performer is putting 101% of their heart and soul out on the stage and it’s a beautiful thing to watch. I hope that The Seeing Place Theater continues to push the boundaries of theater in the off off Broadway community by producing thoughtprovoking, smart, and well-acted theatre. Oh, and tickets are only $12. You really can’t beat that." Peter Filichia, Kritzerland - "I always get to the Seeing Place Theater whenever this young, ambitious company does a show. Even after only a few productions, I learned that Brandon Walker and Erin Cronican are two wonderful actors in town. And while Walker has a big part in Love Song, the current production of John Kolvenbach’s play, Cronican has a small one. (Well, she did direct, too.) Was I disappointed? No – because Seeing Place offered me two other extraordinary actors: Marnie Klar and Jason Wilson, playing a married couple that just doesn’t know what to do with her moody and seemingly unstable brother Beane (Walker). Suddenly, however, Beane has perked up because he’s found love. Or has he? If that sounds odd, Kolvenbach well explains it. Find out how at the ATA on West 54th through Dec. 9." Jennifer Szulman, ReviewFix - "Tear Worthy...'Love Song' tackles not only a story between a man and his inner turmoil and the effect it has on those who love him. The issue of mental illness as a whole is presented in a respectable and professional manner. The characters are relatable and seem like they could be your co-workers or next-door neighbors. Beane’s zest for life is replenished with Molly’s presence and when he’s in high spirits, the happiness is contagious. 'Love Song' is a beautiful story and may even cause you to shed a tear or two." 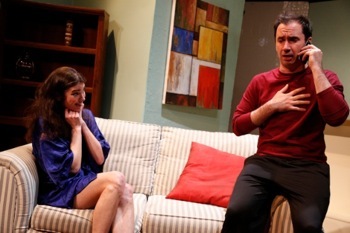 J Scott Mitchell, Reviews Off Broadway - "A Funny and Touching Love Song... The Seeing Place Theater is exploring 'Fantasy vs Reality: The Games Our Minds Play' this season, and they have opened with a wonderful show, Love Song by John Kolvenbach...Erin Cronican’s character Molly benefits from lovely writing, and she gives a nicely restrained performance. A burglar that stirs emotion in wounded psyche, and then responds to it, is a tough act to render believably. 'Love Song' is sweet and funny, as well as a fascinating look at the power of emotion. So much of the story and acting is great...the play flows beautifully." Rob Lester, NiteLife Exchange - "The Seeing Place must be the place to go...While I must say I was more taken with the acting and sympathetic portrayals and directing choices than the play itself, I was increasingly pulled in, especially in the second act...Certainly this strong company of actors make their characters' personalities immediately felt, through nicely detailed arsenals of quirks, looks, and interaction...A play that makes us think without preaching or providing pat answers is always welcome." J.R. Yussuf, Actor Blogger - "[The play] reminded me that we are all incredibly fragile and our actions & moods affect all others in our lives, much like dropping a pebble into a pond. You see the ripple effect of Beane "getting better" everywhere you look...The acting was completely natural, best described as conversational. I felt like I was watching everyday people live their everyday lives...This production was incredibly intriguing and played by beautiful spirits that obviously enjoy truth on and off the stage. It left me with a bittersweet feeling at the end that was only satiated by the mini-talk-back in the lobby once it was done. I would recommend people of all ages and ethnicities to see this play because of its affordability (only 12 bucks!) and because it did a good job of bringing mental illness to a proximity that made it look more normal. " Emma J Purvey, Actor Blogger - "As an actress it's always a pleasure to watch other performances. I find myself walking away entertained and inspired by the experience. Such was the case with the play Love Song by John Kolvenbach, performed by The Seeing Place Theater...The theater is in a great location, only moments from Columbus Circle. Love Song ends on December 9th so I would purchase tickets now before they sell out. It feels good to support Indie theater. The Seeing Place Theater is known for intensely intimate ensemble work. That passion and intimacy is evident in Love Song." This production was produced alongside our off-night, Special Presentation of Robert King's award-winning solo show, Halfrican American.